(1995/Delmark) Malachi Thompson is impressive not only because of his talents as a composer and a soloist, but also because of his versatility. The Chicago trumpeter has no problem playing Blue Note-flavored hard bop/post-bop, but he's equally comfortable in avant-garde situations. Though Clifford Brown, Lee Morgan, and Freddie Hubbard are strong influences on Thompson, he has also learned a lot from Lester Bowie. In fact, Bowie is a featured guest on Buddy Bolden's Rag. This superb CD finds Thompson celebrating the contributions of New Orleans cornetist Buddy Bolden, one of jazz's pioneers and a major influence on such greats as King Oliver and Louis Armstrong. It has been argued that Bolden single-handedly "invented" jazz in the 1890s, and while it's a stretch to say that he invented jazz all by himself, he most certainly played a crucial role in its development. (Jelly Roll Morton, by the way, claimed to have "invented" jazz -- again, no one should take credit for single-handedly inventing it). 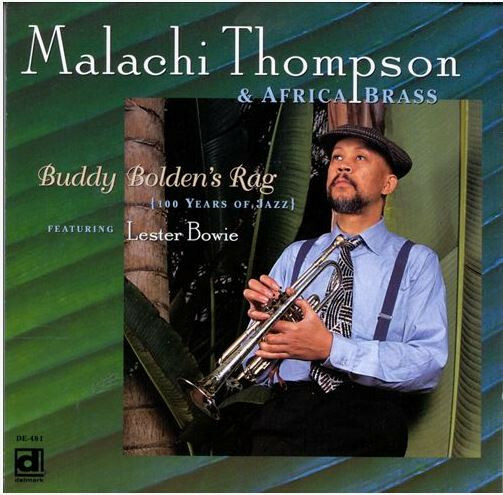 On Buddy Bolden's Rag, Thompson and his band Africa Brass salute Bolden in an unconventional way; instead of playing traditional New Orleans jazz, they provide inside/outside post-bop that acknowledges Crescent City brass bands as well as avant-garde and AACM jazz. Thompson looks back on jazz's early history but does so without being the least bit dogmatic about it, and the result is a very enriching and unpredictable CD. Customer evaluation for "Buddy Bolden's Rag"